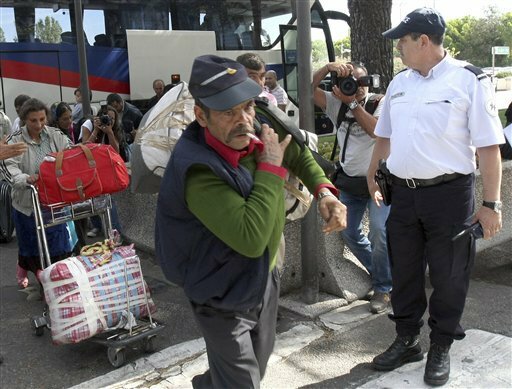 BRUSSELS — France’s deportations of Gypsies are « a disgrace » and probably break EU law, the European Union’s executive body declared Tuesday in a stinging rebuke that set up a showdown with French President Nicolas Sarkozy’s conservative government. In recent weeks, French authorities have dismantled more than 100 illegal camps and deported more than 1,000 Gypsies, also known as Roma, mainly back to Romania, in a crackdown that has drawn international condemnation. France could ultimately be slapped with a fine by the European Court of Justice if its expulsions are found to have breached EU law. The crackdown continued Tuesday, as a chartered Airbus took off from the southern city of Marseille for Bucharest with 69 Roma on board, police officials said. Like others repatriated by France, they received a stipend of up to euro300 ($385) per person for resettlement. At Bucharest’s Baneasa Airport, Argentina Rosca, 30, seven months pregnant with her sixth child, lugged a huge bag as she exited the airport. « It’s good to be back because my children are here, » she said. In Paris, French Foreign Ministry spokesman Bernard Valero expressed « astonishment – that’s the least you can say » at the announcement by the European Commission. Sarkozy’s office refused to comment on Reding’s statement. Roma face widespread discrimination in housing, jobs and education across Europe. As EU citizens, they have a right to travel to France, but must get papers to work or live there in the long term. The advocacy group Romeurope estimates that up to 15,000 Roma live in France. French authorities have no official estimate. Sarkozy has linked Roma to crime, calling their camps sources of prostitution and child exploitation. He has insisted that France does not want to stigmatize Roma, but the deportation policy is being criticized as discriminatory because it singles out one community. Interior Minister Brice Hortefeux defended the policy in France’s National Assembly on Tuesday. « We do not evacuate … illegal camps because they are Roma’s, we dismantle them because they are illegal, » he said. She also harshly criticized French authorities for telling the EU commission that it was not discriminating against Roma – a claim apparently contradicted by news reports of a government letter ordering regional officials to speed up a crackdown on illegal Roma camps. « It is my deepest regret that political assurances given by two French ministers is now openly contradicted, » Reding said. She was speaking about France’s immigration minister, Eric Besson, and its European affairs minister, Pierre Lellouche. Besson on Monday denied any knowledge of the reported Interior Ministry letter and did not speak to reporters Tuesday at a Brussels meeting on asylum issues. Hortefeux issued a new letter late Monday about dismantling illegal camps that had no reference to Roma, the ministry said, but it would not provide a copy of the new letter to The Associated Press. Some critics said the apparent flip-flop was part of a bald effort to erase any suggestion that Roma were being targeted by ethnicity. Reding said she was « looking into the legal implications » of the new wording. « It is important that not only the words change, but also the behavior of the French authorities, » Reding said, adding she was asking French authorities for swift explanation of the matter. Associated Press writers Jamey Keaten in Paris and Alison Mutler in Bucharest contributed to this report.